* Lt. Comdr. Victor Hicks, USNR, relieved Comdr. J.M.Miller on 28 October 1943.
on PGM Boats, PT's, etc. "1. It is requested that this command be supplied with twelve (12) bazookas and 150 rounds of ammunition for test firing. "2. This squadron expects action against light enemy surface targets, supply and personnel barges, armored and heavily armed with machine guns. 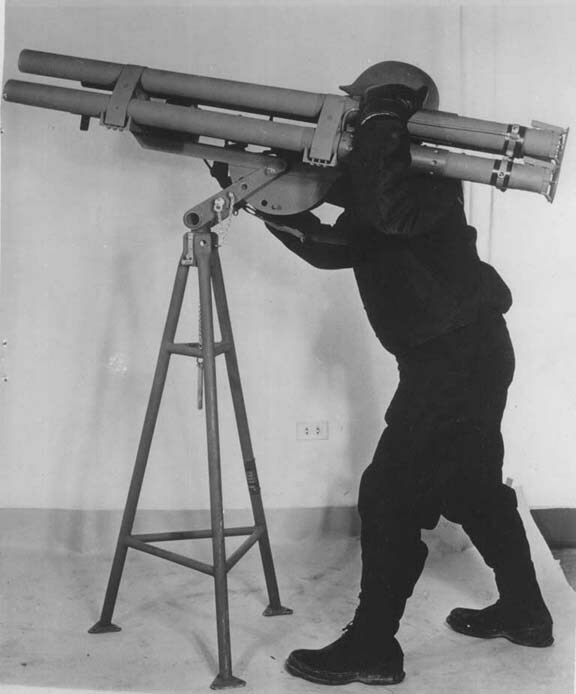 It is felt that subject, 2".36 rocket launcher, may be particularly effective for Motor Torpedo Boat use because of its light weight and destructive power." 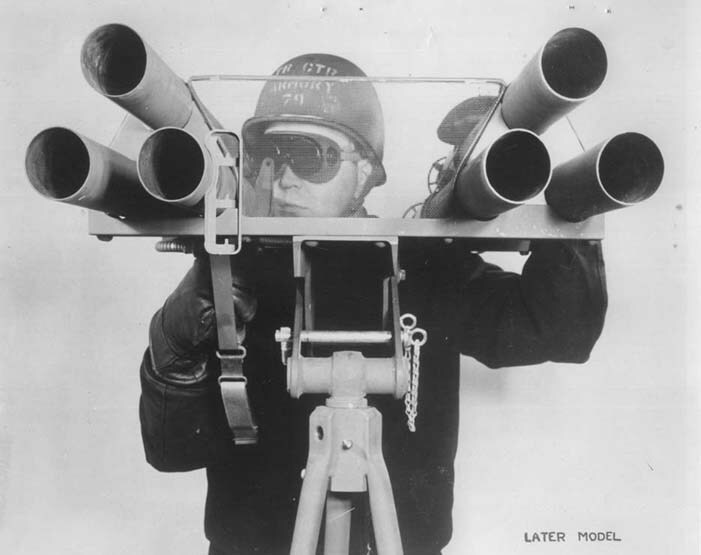 (a) That six Army Launchers, Rockets, AT Ml (commonly referred to as "Bazookas") should be secured together on an adapter for mounting on a Mark 19 .30 caliber machine gun mount. (b) That a six-way magneto firing key Mark 21, recently developed through the Magnavox Company for firing rocket launchers, would be used to fire the Army 2".36 M6A1 (Service H.E. loaded) or the M7A1 (practice, inert loaded) rounds. This device permits firing one rocket for each squeeze of the trigger, which was the safest procedure to adopt. 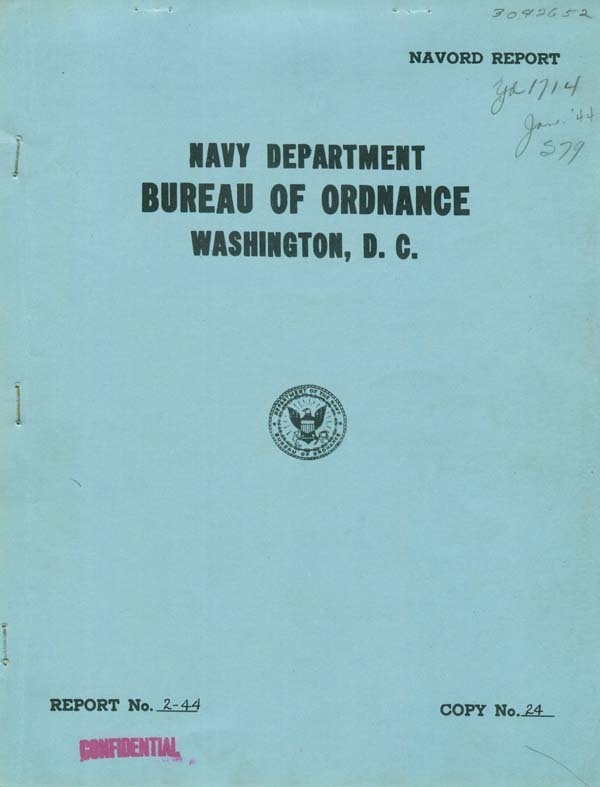 (c) That in view of the urgency of the request, and the fact that MTB Squadron 25 was due to depart from Navy Yard, New York by 30 September it would be best to have the work done by the New York firm of W. D. Teague, Contract Engineer on contract NOrd 414 Project P.
(d) That a project supervisor should be assigned from the Bureau, and that this officer was to proceed to New York and remain in liaison with W. D. league's Engineers, the Navy Yard, New York, and M.T.B. Squadron 25 until the design was satisfactorily completed. Captain H.E. Jones. (USMCR) was appointed to perform this supervision, which duty was to be performed early in September, 1943. "l. On arriving in New York I contacted Squadron 25 and made arrang-ments to act together with every one interested and lay out a plan to work on. "2. On Friday, 10 September 1943, Robert Harper and two other engineers of Walter Dorwin Teague, Lt. Thompson, Lt. MeKean and myself met at the Havy Yard and went aboard a FT Boat. .. ; I-t- was-decided that the Mk. 19 .30 caliber machine gun mount would be adaptred and use*/ with two clusters of three barrels each spaced so a man could stand between them. . . .
"3. Since the MT Squadron has to leave New York by the first of October, it was decided to use six-way Mark 21 firing ke^s for the tv/elve adapters they need to take along, rather than to develop-a new firing system...."
"1. On Saturday September 18, 1943, Robert Harper of Walter Dorwin league and I went to Brooklyn Havy Yard witn the first two samplfe models of the subject Isunciier. Adapters to fit both the hark 19 .30 caliber machine gun mount end the .50 caliber machine mount mounted on the forward deck of PT Boats were taken along. Lt. D. S. Baughrnan, Jr.. Commanding Officer of Squadron 25, was interested in the lighter hk. 19 mount with some modifications and this was adopted PS standard. "2. On Monday we went out to sea on a PT Boat with the launcher mounted on the Hark 19 mount and fired 50 rounds of 116 Al HE loaded rockets. The first were fired by remote control after running the cable down the forward hrtch. These rounds landed about 300 yards sway with a box pattern about 2 varrls square. *BuOrd (Re5e Subsection) file "Sextuple. Bazookas"
**.BuOrd (Re5e Subsection) conf, file "Sextuple Bazookas"
did not damage the deck, but would be injurious to personnel standing less then 20 feet in rear of launcher. Lt. Baughman seems to think that the personnel will be clear of the blast at time this launcher is used. "4. It was found that these projectiles could be fired in front of the target, and skipped in at a very low angle without detonating the fuze. "5. Lt. Baughman accepted the adapter we tested, and Walter Dorwin Teague completed and delivered 12 units to MTB Ron 25 prior to the sailing date..."
"2. Each cradle contains six launchers held together securely by angle iron straps. 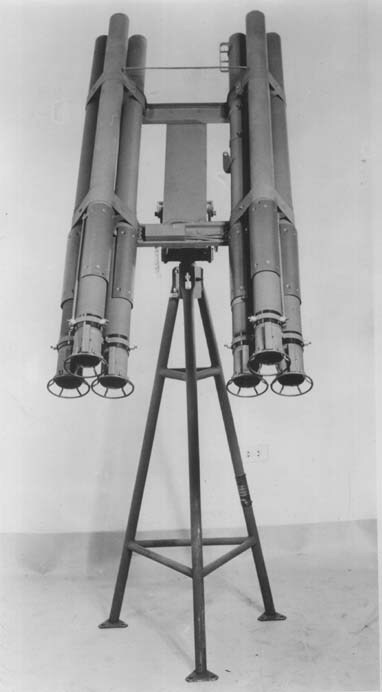 The launchers are fired by a single six-way (Mk. 21) magneto firing key mounted on one of the launchers. The cradles are mounted on standard .30 caliber machine gun mounts. 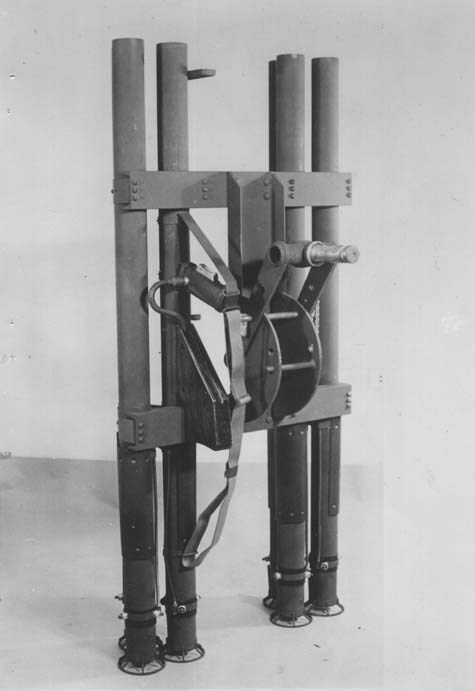 A test model consisting of four launchers on a standard .30 caliber machine gun mount was used. The test was conducted oh a Motor Torpedo Boat at sea. The mount was located on the forecastle about twenty-five feet forward of the cockpit. Weather condition was: moderately choppy sea, light wind, visibility clear. Forty rounds were fired in all. About thirty rounds were fired at a 50 gallon oil drum and at light packing cases, at ranges varying from 300 yards to 30 yards. Two hits were made on the packing cases. Neither of these exploded, as the cases were light 1/2" soft wood. None of the other projectiles exploded from water impact. The accuracy of the fire was not entirely satisfactory. This is attributed to the inexperience of firing personnel. 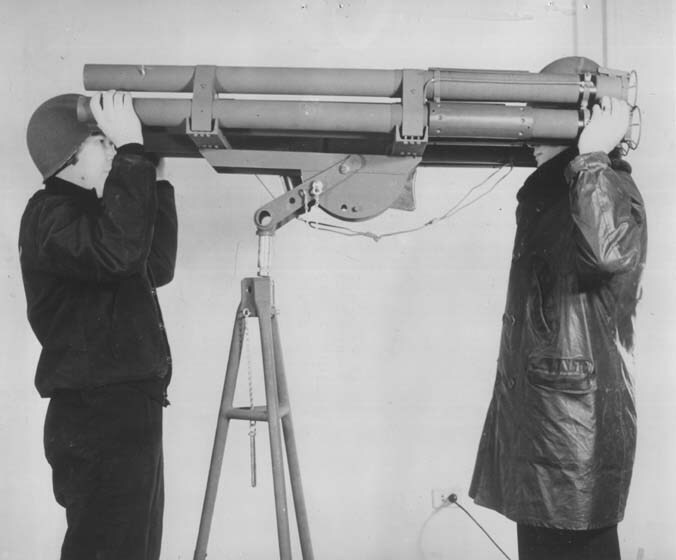 The weapon was fired at a high angle of elevation (about 70°) to test the effect of the blast from the breech. Pieces of paper were taped to the deck. There was no burning or charring of the deck or of the paper. The center of the blast (center line of the launcher) hit the deck at a distance of about six feet on some of the shots. One shot was fired dead ahead with the breech blast directed directly toward the cockpit. The air blast was perceptible, but not sufficient for discomfort. The tests were fired the morning of 4 October 1943 at Fort Tilden, New York. The range was approximately 25 yards. Ten rounds were fired. The first two shots were complete misses. The rockets failed to explode on the glancing impact with the ground. The third rocket was fired at 1/8" mild steel plate. The resultant explosion made two holes, one (presumably where nose of rocket hit) about two inches in diameter and another alongside the first, triangular in shape, with the metal bent back to make the triangle. The legs of the triangle being about 1 1/2 ft. long. The fourth shot fired at a one inch thick soft wood packing case, failed to detonate. The fifth shot was fired at a 1/8" mild steel plate. The resultant explosion was similar to that of the third shot. The sixth and seventh shots were fired at two inch thick soft wood planking. Both rockets exploded, demolishing the target, and littering the ground with pieces of wood and splinters. The eighth rocket was fired at 1/4" STS steel. The resultant explosion tore a hole one inch in diameter in the plate. The ninth shot was a miss. The tenth shot was fired at a one inch thick soft wood packing case. The rocket failed to detonate. There was considerable flash to the explosions. It is believed this would be very effective against enemy personnel. "5. Conclusions: Further tests will nave to be made to determine whether the weapon is accurate enough for use on Motor Torpedo Boats. It is believed that sufficient accuracy can be obtained with experience. craft. In this use it might be desirable to make the fuze more sensitive so the rockets would explode on water impact. It is understood that this can be accomplished without too much trouble. This would make the very close misses effective against the small craft, the more distant misses effective against personnel, and would have a demoralizing effect on the enemy. "For firing at short range, further experiments will determine whether it would be more desirable to use the present fuse in order to take advantage of ricocheting hits, or make the fuze sensitive enough to explode on water impact. "Further experiments should be made at night to determine whether the tracer effect of the rockets is sufficient to permit aiming corrections on successive shots, or whether splash is sufficient at night to permit aiming corrections. "6. Additional reports will be submitted when more ammunition is obtained for further experimental firings." "No decision regarding adoption of this weapon as armament for other PT squadrons will be made pending report of tests conducted at the Motor Torpedo Boat Squadrons Training Center, Melville, Rhode Island." 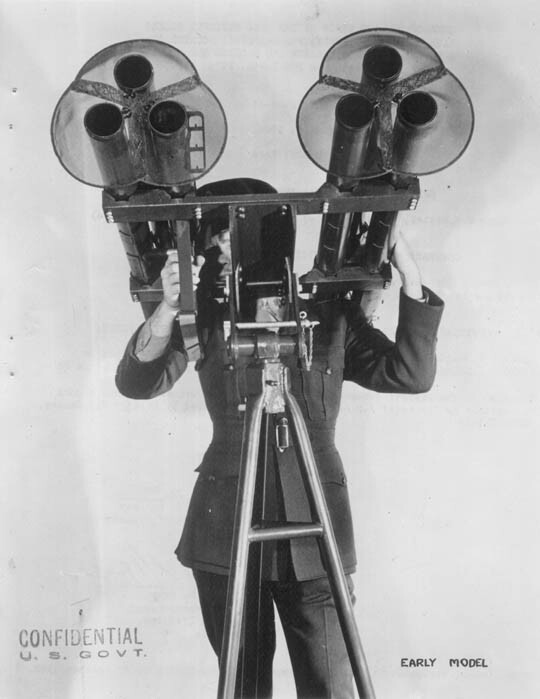 "This Squadron has been supplied with twelve rocket launcher mounts. A Mk.19 caliber .30 machine gun mount is used as a base. The mounts are located on the day-room canopy of each boat. The rocket launchers can be fired on relative bearings from 045° to 315°. "The tubes are fired by a magneto firing key to eliminate an outside source of current. The firing key has an automatic six-way selector switch, wired to provide alternate firing of a rocket from each side of the mount. One rocket is fired each time the firing key is closed. "The original sights attached to the in-board tube on the right side are used. The tubes rest on the shoulders of the gunner and are steadied by his left hand, thus giving him complete snd steady control of the mount. (a) The mount is easily controlled by one man although a second man is needed as loader. (b) The mount should be about twelve inches lower. (c) The magneto firing key end selector switch is compact and easily handled. (d) In daylight reasonable accuracy may be attained up to about five hundred yards. (e) At night there is no way of spotting the shot*, due to the absence of tracer. "The absence of tracer* prevents the accurate use of this weapon at night at ranges of over approximately one hundred yards. However, it should prove a very valuable weapon for finishing off landing barges. Landing barges may be hit by hundreds of rounds of machine gun fire and still not sink. It is necessary to approach at close range and sink the barge with a heavier weapon. This rocket launcher will effectively serve the purpose. The six tubes furnish the desired fire power. "A report of the service tests of this weapon will be submitted." 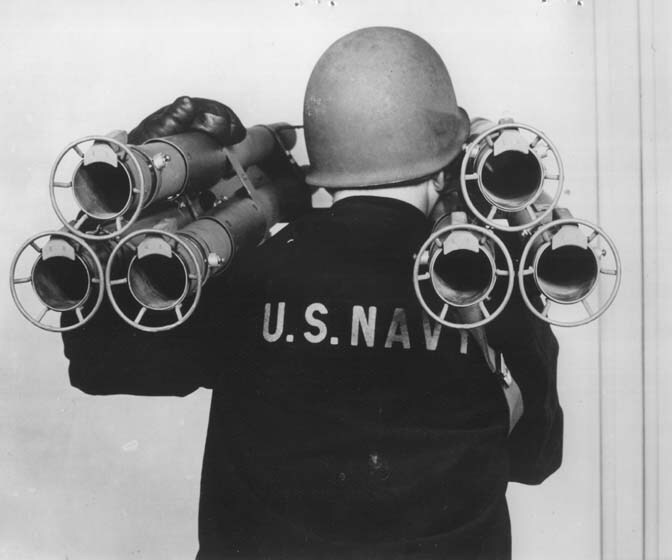 The decision to include Sextuple Rocket Launchers Mk.l as part of the armament of some modified 110' Submarine Chasers, to be known as Motor Gunboats (PGM 1-8 inclusive) was contained in a letter from the Chief of Naval Operations to the Chief of the Bureau of Ordnance dated 17 December 1943** One Sextuple Launcher and 120 rounds of ammunition are specified for each vessel. * Note by BuOrd:- It is understood that the Ordnance Department of the Army is experimenting with Bazooka ammunition fitted with night and day tracers. Until this has been developed it should be practicable to illuminate the target with some of the various devices now in service. Among the newer ones would be the Snowflake Rocket Launcher, the 60 mm Mortar (firing an illuminating grenade) etc. of the Sextuple Launcher appended to this report. 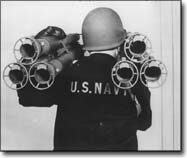 The net result of the work that has been done under the Bureau of Ordnance is merely to adapt six Army "Bazookas" (as shown by the above mentioned photographs) for use as a semi-shoulder weapon on one mk.19 mount. It is believed that (under moderate sea conditions and with proper illumination) there is a good chance that a skilled operator may be able to get at least two hits out of each ripple salvo of six rockets fired from a PGM or PT Boat making slow speed at night at about 250 yards range against a barge target 20 feet in height. Only unofficial reports, however, are as yet available on this subject. 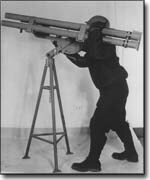 Although this rocket launcher was developed for boat use, it is quite possible that the "Sextuple Bazooka" might be of some importance also in land and amphibious warfare if mounted on tanks, jeeps, etc. It might be useful to paratroops if mounted on one of the smaller and lighter jeeps designed particularly with paratroop needs in mind. The advantage of having six barrels, which may be loaded before the enemy is contacted (and which may be sufficient to destroy him without a reloading operation) is obviously worth considering for situations where time is the main or all essential element of victory. Uncovered by John Fitzgerals, ACE.